First up, a Very Happy New Year and I hope it’s going to be a cracker for you! Last summer, Andrew Tozer and I were walking the footpath around St Anthony – one of Andrew’s favourite locations – and whilst on that trip, we walked past the old Paraffin Store – a stunning little Victorian building on the coastpath which did as its name suggests for the lighthouse back in the day. 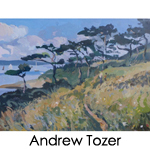 Since visiting here over the last thirty years, I’ve always wondered what this lovely little building could be used for, and that’s when it occurred to me: how about an exhibition of Andrew Tozer’s St Anthony paintings there, surrounded by the landscape that had inspired them? 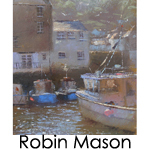 Andrew is a big fan of the Victorian painter, Charles Napier Hemy, who is famed for his Cornish seascapes, often of St Anthony. 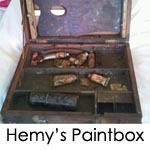 It turns out that Andrew was sauntering though some antique shops recently and came across Hemy’s paintbox, which he duly bought. So after well over 100 years, Andrew will bring this paintbox home as part of his residency there and use it for the collection you are invited to. Such a delightful story! So, if you can make it here on the Whitsun bank holiday week, we will be holding a ticket only exhibition opening evening . Of course I will send you a personal invitation to this nearer the time, but the exhibition will run throughout the following week, anyway, if you can’t make that particular evening. Well, I’ve got so excited by all that, I’ve not left much space to let you know about that other things that are new. Some delightful new Lynn Goldens just in and, after selling out of Ilric Shetland’s incredible (and popular!) 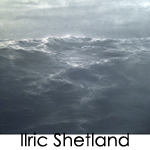 seascapes, we’ve got two new ones in for you… but don’t delay, they move fast! 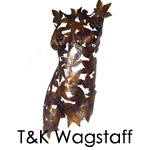 We’ve also had in some new Robin Mason works and some smaller versions of Terence & Katrina Wagstaff’s beautiful Torso sculptures made from copper lattice – exclusive to The Harbour Gallery – so if you fancy a winter pick-me-up, how about some of those lovely works of art to brighten up your walls on these dreary winter days? Well, I’m having three days break this month – off up to see my Goddaughter in Kent – but otherwise, I’m here for you lovely people Wed-Sun 10.30 – 5pm as usual. 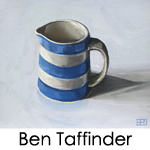 Looking forward to seeing you and in the mean time, I hope you enjoy this month’s Podcast with the impossibly handsome and talented Ben Taffinder who has just let us have a list of brilliant still life online-only exclusives, so have a peek at those little puppies!